"Whoever is not willing to give his life, whoever doesn't know that the dead lion is more alive than the living dog, will stay a dog." I readily cop to near-total ignorance about Israeli filmmaking, and my knowledge of the politics of the country are just a few notches above. 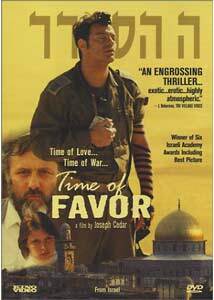 Time of Favor apparently is the best, cinematically, that Israel has to offer—it garnered many awards in its country of origin, and the DVD case is festooned with gushing pull quotes from American critics. In many respects its glimpse into politics is more fascinating than the story it has to tell, but it's a pretty respectable effort, and a worthy calling card for the Israeli film community. The movie takes for granted a good, working knowledge of internal Israeli politics, and for an American audience, that cuts both ways: it's nice not to be patronized to and you get the sense that this may be very much what it's like in the political trenches, but on the down side, it's easy to get lost in the labyrinthine and violent world of Israeli public life. Similarly, it's refreshing that this isn't a cliché-ridden tale of a Palestinian and Israeli making friends despite their political differences, for you may approach this movie with the fear that it's going to be little more than a West Bank Romeo and Juliet. Happily, it is not. Rabbi Meltzer (Assi Dayan) is a charismatic, fundamentalist figure with a fiercely devoted following, and the Israeli Army is ready and willing to establish a unit made up exclusively of his true believers. It's sort of like the U.S. Army turning over the command of a squadron to Pat Robertson or Louis Farrakhan, and giving them a tremendous amount of latitude and access to military materiel. Whatever your politics, this pairing of religious zealotry with high-powered automatic weapons and explosives is a terrifying prospect. Meltzer's most promising protégé is Pinchas (Edan Alterman), a bookish sort who soaks up the rabbi's teachings like a sponge; and Meltzer promotes the Old Testament tradition of treating women like chattel, as he wants to reward Pinchas with the favors and attention of his daughter, Michal. (She is played by a young Israeli actress who has unwisely chosen to bill herself only as Tinkerbell.) Michal has other ideas, though, and chooses brawn over brains—the follower of her father's who has captured her fancy isn't Pinchas but Menachem (Aki Avni), the commander of one of Meltzer's military platoons. And not incidentally, Menachem and Pinchas are the best of friends—will they let a girl come between them? It's not a tremendously dramatic or original love story, though the movie picks up steam in its second half, when Pinchas, carried away by some of Meltzer's sermonizing, hatches a renegade plan to steal some explosives and do some damage in Jerusalem, in the name of the lord. (I fear that this review gives away too much of the plot, but it can't hold a candle to the copy on the back of the DVD case, which pretty much spills out the whole movie in just a couple of paragraphs.) A climactic chase through ancient catacombs provides lots of dramatic possibility, and most of them are pretty well utilized. Many of the things that are most rewarding here are bits that Israeli audiences probably take for granted, and that don't make it into a ninety-second report on the nightly news. The degree to which the military is a day-to-day presence for all Israelis, the arid landscape that's been so punishing for so many millennia, the presence of history, of treading daily over ruins and grounds that have been fought over since the days of Abraham, Isaac and Jacob—they're all among the incidental fascinations of this movie, and help carry along an American audience through a plot that isn't always terrifically full of tension and dramatic interest. Image Transfer Review: Many scratches and pock marks show up on the print, which is unfortunate, as the cinematography seems fairly accomplished. The film stock may not have been of the highest quality, because there are some serious resolution problems�these are evident especially in night scenes, when the actors aren't well lit and lots of grain can be seen. Audio Transfer Review: Lots of location shooting means that the sound quality is uneven, faring better in interior scenes, and calling for a good amount of looping work from the actors. Ambient noise is frequently a problem, and buzz and hiss are high especially in some of the exteriors; you can occasionally even make out the wind whipping into the microphones. Extras Review: Chapter stops, an original trailer, and trailers for three other Kino titles are the only extras. A warmed-over love triangle made somewhat new by the uniqueness of its setting, Time of Favor works best as a look at a part of the Israeli landscape, both geographically and politically. Not necessarily great cinema, but it sheds more light on the situation in Israel than hours of watching Ashleigh Banfield ever could.